The 1920s was a time of major social and cultural change. Often referred to as “The Roaring 20s,” it was a time of prohibition, flappers, and bootleg whiskey. With the 18th Amendment in force, there was an increase in black market alcohol, speakeasies, and mob activity. Women voted for the first time in the national election in 1920. The end of WWI created a post-war housing boom, and the average annual income was $1236. Quotas were set for immigrants coming into America, and Ellis Island closed in 1924. In 1925, The Butler Act passed in Tennessee, prohibiting evolution from being taught in public schools. The 1920s also brought the first transatlantic flight. Airplanes were used for purposes beyond war, making airmail and global travel available to the public. The first motion picture with sound, Don Juan, premiered on Broadway. The Oscars and dance marathons were introduced, and the first radio networks provided entertainment, news, and new ideas. It was during this decade of excess, glamour, and intolerance that T.S. Eliot published The Wasteland and F. Scott Fitzgerald The Great Gatsby. Cleveland’s population surpassed that of St. Louis, making it the 5th most populated state in the nation. Perhaps the most notable event of the 1920s happened at the end of the decade, with the crash of the stock market on October 29, 1929. As the teachers were focused on the very important business of educating the boys in mind and heart, the building that had been proposed and generously funded faced numerous logistical delays. Constituents were getting anxious: “We have talked of this new building for two years and if something is not actually done in the near future, this talk will react on the good name of the School,” remarked Chester Bolton in 1921. Finally, on April 19, 1922, the Lyndhurst campus opened, helping to establish Hawken School as a strong institutional presence in the Cleveland area and creating a significant boost in student and faculty morale. It was not an easy transition; there were concerns that families would not want to hassle with the logistics of transporting their sons from the city to the country, and some did in fact threaten to withdraw them. Those threats in part accounted for the unusual timing of the move. 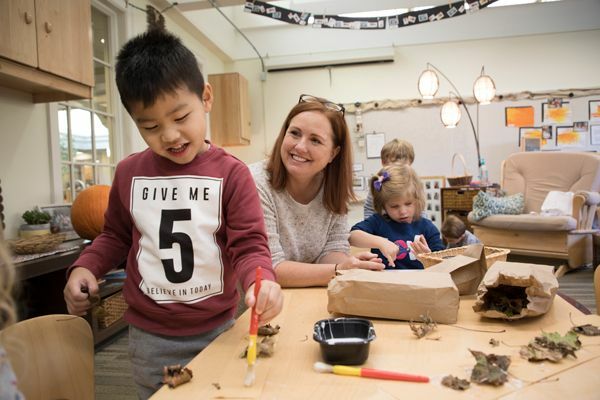 Hawken reasoned that parents would be unlikely to withdraw their sons before the end of the year, and by the time school closed for the summer, the boys would be accustomed to the longer commute and happily settled in the new environment. Hawken’s hunch proved true. The long commute from city to country proved to be an educational adventure and a bonding experience in and of itself. Eastern Traction Company provided a special red trailer car to transport Hawken students. During the journeys to and from school, Mr. MacMahon would tell stories of Captain Dingle’s adventures, the boys learned to play bridge, and some engaged in imaginative improvisations about “Jake and his Bed Trick” or “Rex and His Back Scratcher.” The trolley dropped the boys about a mile from campus. “Over rickety duck boards in a sea of mud, we walked toward the beautiful building,” wrote a student in The Red and Gray Book. “Outside the building were piles of mud, lakes of mud and mud sand traps for losing baseballs and smaller boys in.” This went on for several years until the Interurban was replaced by a bus – surprisingly to the boys’ great dismay, as relayed in poems appearing in the 1925 edition of the Red and Gray Book (see below). The new campus at Lyndhurst was dedicated on June 15, 1922, after the completion of the chapel. The plethora of new space provided “proof of the power of environment,” according to The Hawken Book. For the first time, the boys had room to run and explore; Chester Bolton oversaw a plot of land for boys interested in growing flowers or vegetables. In addition to classrooms (which were intentionally designed small to prohibit the temptation to increase class size), the new building contained a large gymnasium, library, science lab, chapel, stage, and manual training, art, and music studios. The acreage combined with the increased enrollment also enabled the development of a legitimate sports program. By the fall of 1922 the campus boasted a football field, a track, a baseball diamond, and a “rainy day playground.” Hawken’s baseball and football teams celebrated winning seasons with the move to Lyndhurst, and baseball was undefeated in 1922. A surge in school spirit ensued, prompting a special election to vote on school colors. Red and gray won by a significant margin with 19 votes, followed by blue and gray (9 votes), blue and white (6 votes), and maroon and gray (4 votes). Soon after the boys were divided into red and gray teams and real world competitions in all activities including grades began. The 1920s also saw growth in the arts at Hawken. Just as participation in athletics was required, all students took part in the plays, either on stage or off. A new theater was designed by Cleveland Playhouse’s K. Elmo Lowe, who directed Hawken’s first production of Robin Hood in that theatre. Many other firsts were established in this decade: Phelan instituted the Glee Club, the orchestra was formed, Smeed initiated the Cartoon Club, the Debating Society was established, and the first publication of Hawken School Review was released, to name a few. 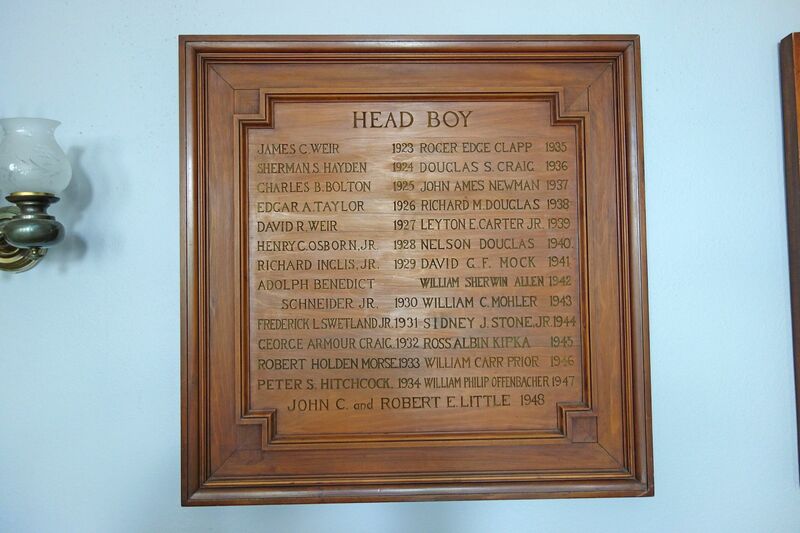 (The Red and Gray Book of 1924 wrote about The Debating Club: “It cannot be said to be anything but an embryo yet, as there have been but few meetings and yet fewer debates, all of which were given before the club alone.”) Other firsts include the establishment of “Head Boy,” the first school dance, the establishment of the Red and Gray Societies, and, in June of 1924, Hawken’s first graduating class. With the graduation of Hawken’s first class came the original alumni, who formed the Hawken Club at the first December alumni banquet, which was described in The Red and Gray Book “all that a banquet should be.” Later to become the Hawken Alumni Association, the Hawken Club was a loyal group, with 42 members attending the 4th annual dinner of the Hawken Club in 1928. Even during the school’s infancy, curricular innovations were happening at Hawken. David Russell recalled, “Innovation and good educational stimulation was always encouraged at the school. Consequently it was one of my interests to introduce science in the lower school grades – really something new at the time (1929) and tough to squeeze in a conventional rigid curriculum in the public schools.” This led to science experiments, nature studies, and field trip hikes – which drew the attention of science professor Ellis Persing of the Normal School at Western Reserve, who was writing a novel series of textbooks called Science in the Grades. Because of the relationship that subsequently developed, Hawken students were given the opportunity to try the experiments and ultimately to help “proof” the textbooks. Russell commented that for the boys, “It sure was exciting to find a mistake!” Another “real world” experience for young scientists was writing letters to living scientists about their works. One scientist who actually replied was Thomas Edison. It was not all smooth sailing in the 1920s. The move to Lyndhurst divided the campus to some extent, as there was significant shuffling of grades to different buildings during the decade. 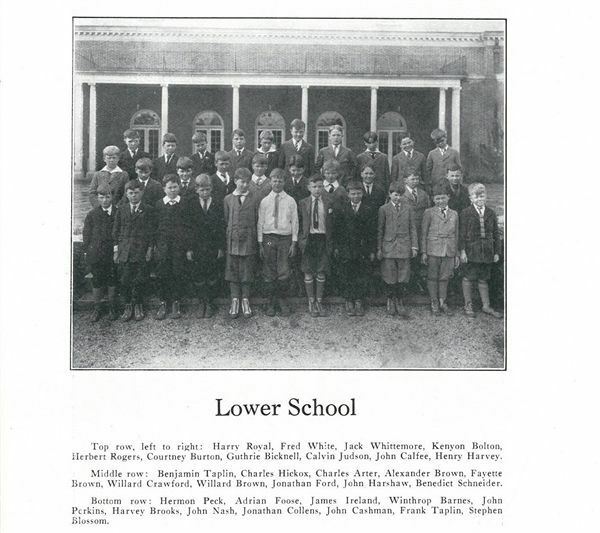 When grades three through nine moved to the new building in Lyndhurst, the first and second grades moved to a house on E. 96th street in 1923. When they rejoined the Lyndhurst campus in 1929, grades three through six moved into a rented house just a short walk from the campus. Other significant shifts occurred throughout the decade as Hawken struggled to establish its presence and identity: the continuation of grade ten (the new building was only intended to go through grade nine) and the addition of grades eleven and twelve. Some have speculated that the expansion of the school through grade twelve in part precipitated another somewhat shocking change: the resignation of James A. Hawken at the end of the 1925-26 year, just one year after taking a sabbatical year in Europe. While Hawken cited health concerns as his reason for leaving, some say that he felt that his work at the school had been done. At one point the seemingly regretful Hawken acknowledged in a letter to Charles Stephens, “And yet had I remained at the school’s head the school would have perished. There’s one chapter in the life of the school that will never be published in its history. 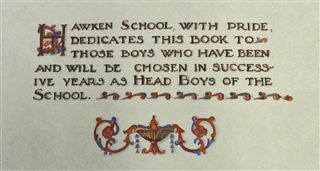 So be it.” Hawken remained involved in the school by heading the search committee that selected faculty member John Carney as his successor and appointing Mrs. Bolton to oversee school policy and management. A “frequent visitor” following his resignation, he was voted a full member of the Alumni Association at the 1928 alumni dinner and served on the Board of Trustees, which was established in June of 1929. The first actions of the new board included granting Carney a sabbatical to begin in October of 1929 and creating two distinct divisions. Each division would have its own principal: Mr. Carney would oversee the upper division and Mr. Smeed the lower. In addition, they created a new position, Director of Education. Carney’s sabbatical began shortly after these changes were implemented, and Charles Stephens stepped up to serve as interim head of school during Carney’s sabbatical leave. At that same time, Mrs. Bolton turned over proprietorship of the school to the board of Trustees. In spite of the “roar” of the twenties, the school was not completely immune to some financial concerns - particularly given that the original estimate of $219,245 for the new building at Lyndhurst fell significantly short of the final bill, which came in at $377,000. Once again, Frances Bolton stepped in to offer aid in October of 1929, agreeing to fund the deficit for five more years and to add additional funding to bring the endowment to $500,000. It is not wonder she was later deemed the school’s “fairy godmother” by another benefactor and trustee who would make his mark beginning in the decade to follow. Those concerns, however, paled in comparison for what loomed on the horizon. On October 24, 1929 – just ten days after the Board reviewed Mrs. Bolton’s generous offer - the stock market crashed, signaling the start of the Great Depression and bringing more challenges for Hawken School to overcome. One of the main issues to be overcome with the move to the new Lyndhurst campus was transportation. Hawken feared that parents would withdraw their sons due to the distance they had to travel to the country; it was certainly too long to walk, and most considered it too long for parents or chauffeurs to drive. James Hawken’s plan to keep families from withdrawing was to move to the new campus before the end of the school year; that way the parents and the boys would be accustomed to the routine and therefore less inclined to withdraw. It was not the easiest commute, to say the least. Students in grades 3-9 boarded a special red trolley reserved for Hawken students by Cleveland and Eastern Interurban’s electric railway system and rode to the village of Lyndhurst. The trolley dropped the boys off one mile from the new school building, so each morning and afternoon, they made the mile-long trek to and from school. While there were no doubt complaints about the hike, especially during periods of inclement weather and frigid temperatures, it proved to be a memorable experience for the boys – so much so that one student lamented the replacement of the trolley “Special” by a Cleveland Transit bus in two poems published in the 1925 edition of The Red and Gray Book. (See p. 32 in The Red and Gray Book, 1925). By 1930, bus transportation was replaced by a fleet of “woodie” station wagons driven by teachers. Shall never more be left behind by thee. Until a bus comes by! O, n’er again! A void? And who wept not to see thee part? Too late. Our love for thee will never cool. His only recreation, only joy. We’ll bless thee for the shelter from the frost. Thou’lt prove a blessing in disguise, we’ll see.